If you have a sink that springs a leak or a furnace that won't turn on, you enjoy peace of mind knowing that repairs will be professionally handled by our experienced maintenance team at Springs Apartments. But what about those everyday hiccups like a clogged sink or a squeaky door? Here's a rundown of the basic fix-it skills that should be in your repertoire. It's fun to personalize your decor with photographs and other artwork, but not so fun when you change it up and find that the wall is pock-marked with nail holes. Fortunately, you don't have to be a builder to make a quick cosmetic fix eliminating those unsightly spots. Before you start, keep in mind that any work of this kind that you do on your apartment may result in charges at the end of your lease if it is not done to Springs standards. This is a common enough occurrence that it really pays off to know how to DIY. While a plunger is the standard tool for clogged toilets, it also works well for plugged-up sinks. 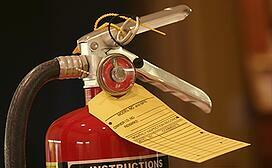 Fire extinguishers are standard safety equipment, but in an emergency, would you actually know how to use one? It's not difficult, but the time to learn is before a fire, not during one. This skill has been the source of endless jokes, but that doesn't mean it's a no-brainer. The biggest issue is ensuring that the new bulb is the correct wattage. If the bulb is broken it's a bit tricky, but a raw potato makes a surprisingly effective tool. Do you feel as though you're living in a haunted house? Petroleum jelly is a stain-free and eco-friendly solution to squeaky hinges. While you can resolve many household problems with a little know-how and some elbow grease, you should never feel forced to attempt a repair if you feel uncomfortable. Contact our Springs Apartments maintenance team for cheerful and effective assistance with these issues.